The purpose of this report is to convey the results of the compressed air energy study performed at Kohler’s Reynosa Mexico facility from Sunday August 10th through Friday August 15th of 2014. The compressed air system is operating at 78% efficiency with a potential for energy savings of over $33,000 annually. This cost reduction can be achieved with a return on investment of less than two years. The compressed air flow in SCFM (Standard Cubic Feet Per Minute) was measured using a CDI Meters 5400-30S flow meter (data sheet in figure 1). 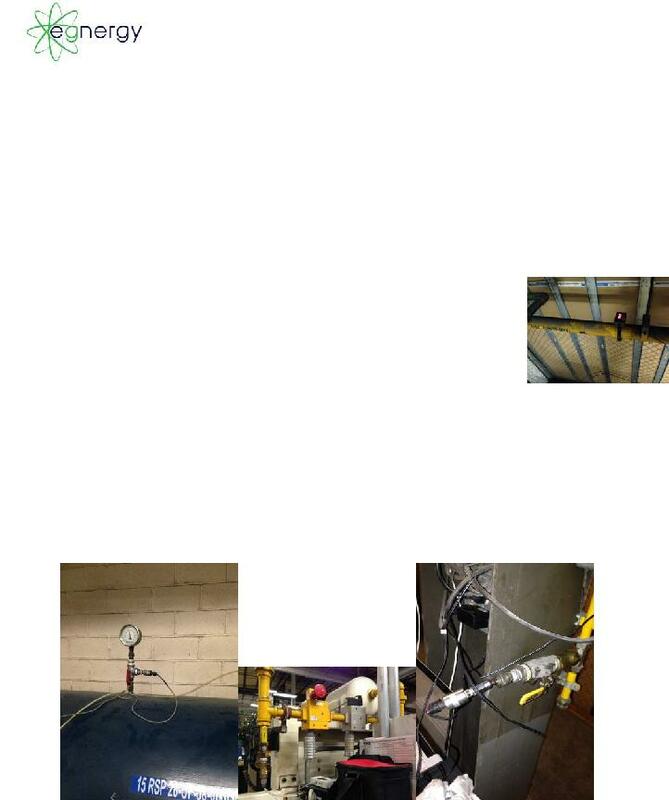 The flow meter was installed in the pipe between the compressed air system and the compressed air distribution system (before the flow control valve). This meter uses a loop powered 4- 20 milliamp signal to transmit compressed air flow to the data logger. The flow is recorded one time per second in units of SCFM. The compressed air pressure was measured using 4 Pressure transducers. 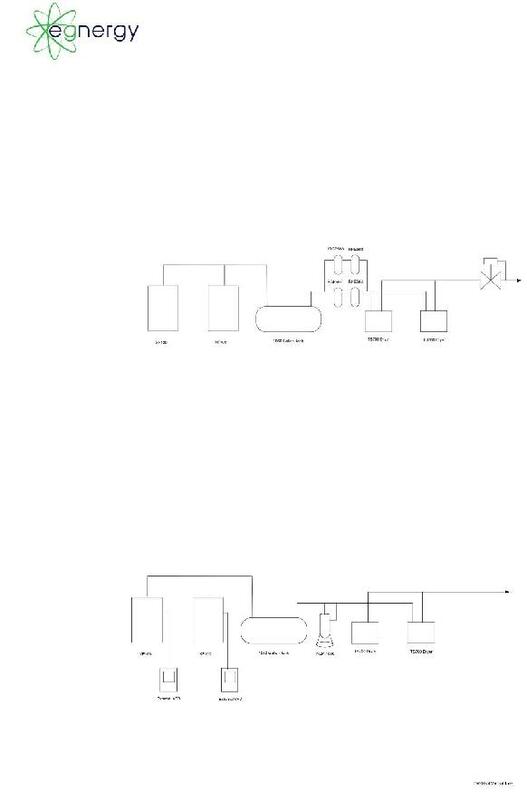 One installed at the inlet of the distribution system, one installed in the tank, and two installed in the production areas (one at Cut to length and one at the channel welder). The locations for measuring pressure in the plant were determined by plant personnel due to the channel welder being most sensitive to pressure fluctuations and the cut to length area being the furthest distance from the compressor room. The pressure transducers used have a range of 0 – 200 PSIG with a corresponding meter output from either 0 – 5 VDC or 4 – 20 mA. 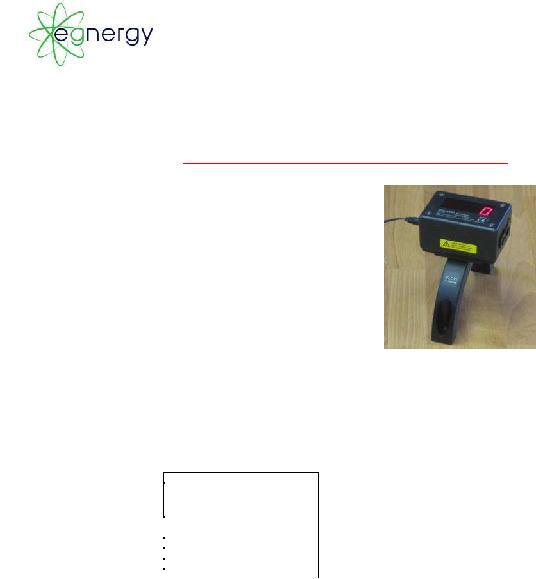 The pressure transducer is connected to the logger using a DC power supply for excitation voltage. Pressure is recorded every 1 second in units of PSIG. 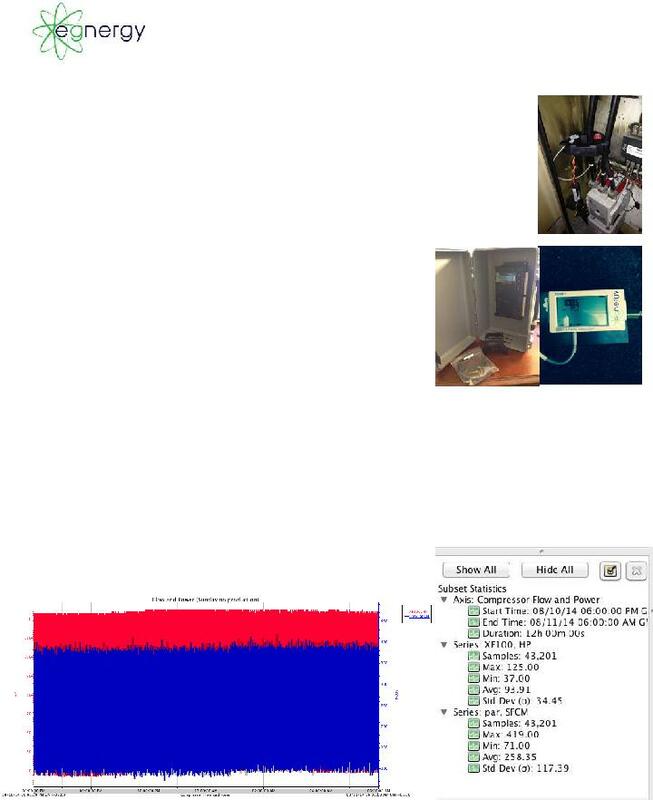 Compressor power was measured using a Veris Industries H8042-0300-2 power transducer. The power transducer monitors the incoming power of the compressor in KW and was recorded one time per second. The power transducer measures voltage and current and calculates power to be output to the data logger via a 4 – 20 mA signal. 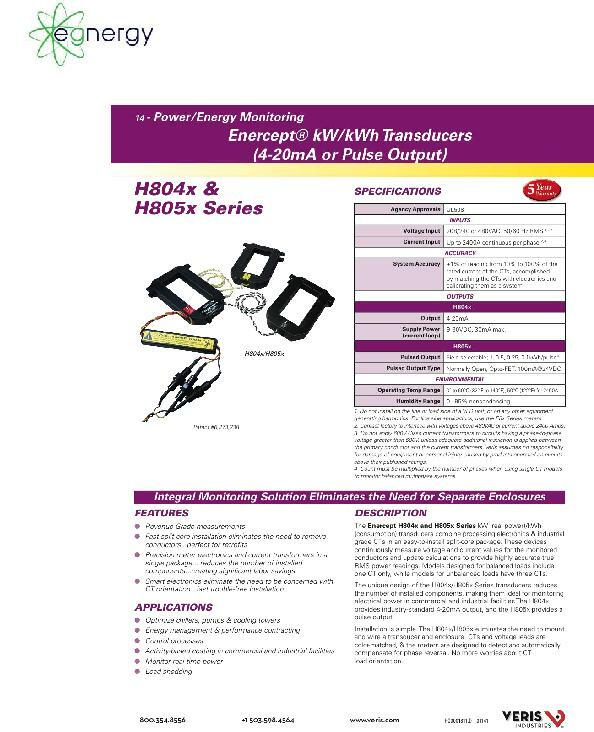 Data sheets for the H8042-0300-2 can be found in figure 3. 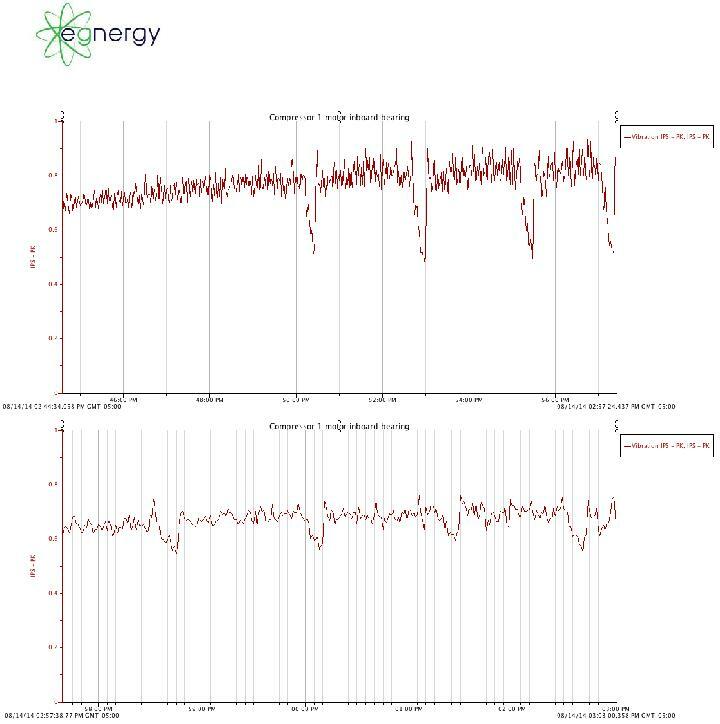 The measurements for flow, pressure, and compressor power were recorded one time per second using two Onset UX120-006M and one LogicBeach IL80. The data is read and graphed through Onset’s software called HOBOware. 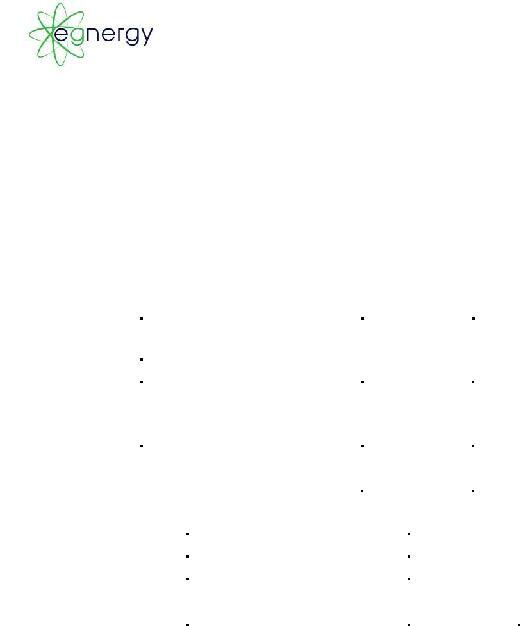 The graph below is a representation of compressed air flow and the power to generate the flow for Sunday 8/10 through Monday 8/11 at 6:00 AM (prior to production starting). The average flow of the system was 258 SCFM and the average power was 93.91 HP. The compressed air usage during this 12-hour period cost approximately $142. Assuming this usage was constant for 24 hours every Sunday the average annual cost is $14,600. 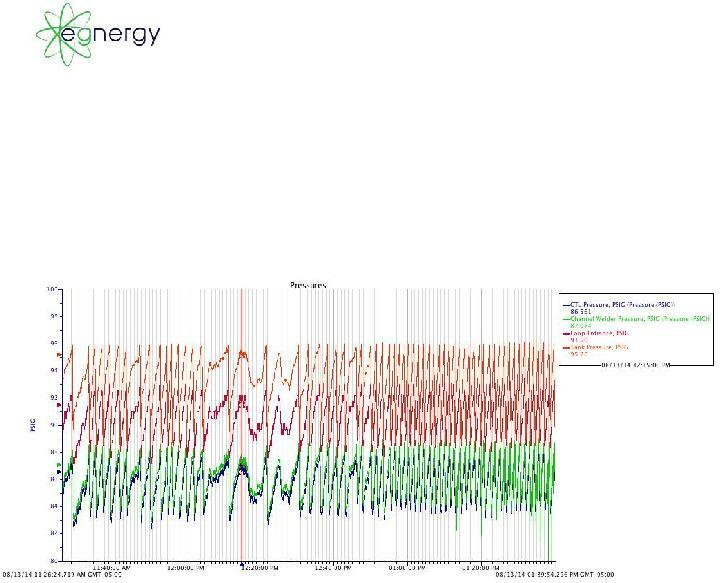 The graphs below show the parameters recorded in the compressor room: Power, Flow, Pressure, and % Efficiency. 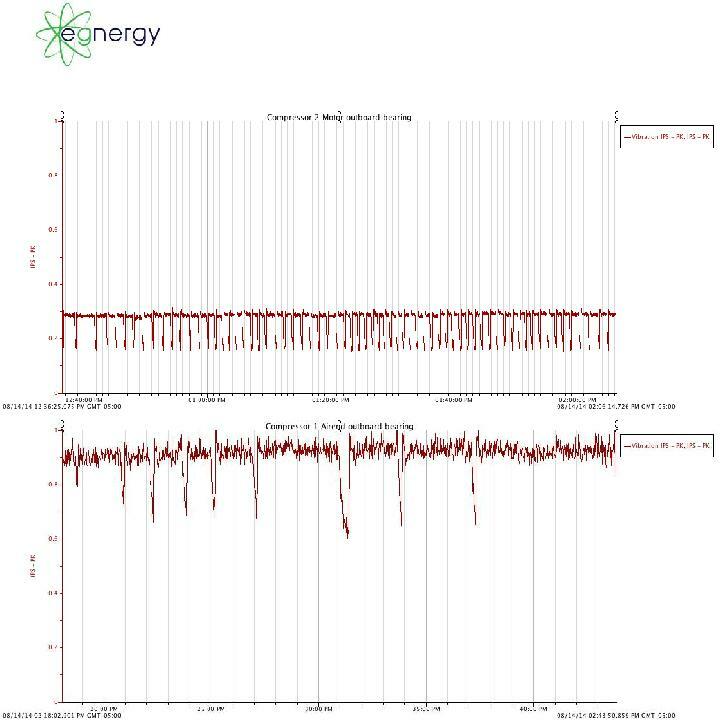 The average power for Monday – Saturday was found to be 106 HP with an average flow of 336 SCFM. The maximum flow of the system was 492 SCFM, which is very close to the capacity of one compressor. During this situation, the compressor is actually operating at greater than 100% efficiency. This is due to the motor operating at 100% power, but not maximum pressure. This condition is known in the compressed air industry as drawdown. The maximum flow event did not occur for an extended period of time, but could cause problems in the future. The annual average cost to run the compressor Monday – Saturday is calculated to be $74,200. 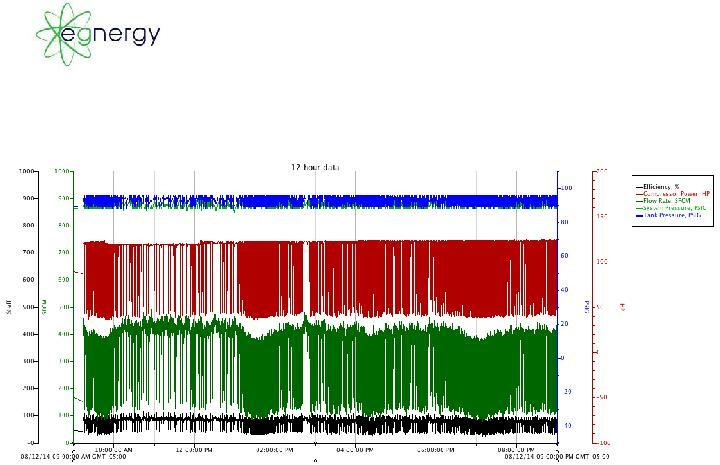 The graph below shows 12 hours of system operation. The graph shows there are periods of high demand within the system. These high demand periods usually last between one to two hours. In this case it occurs around 11 AM. 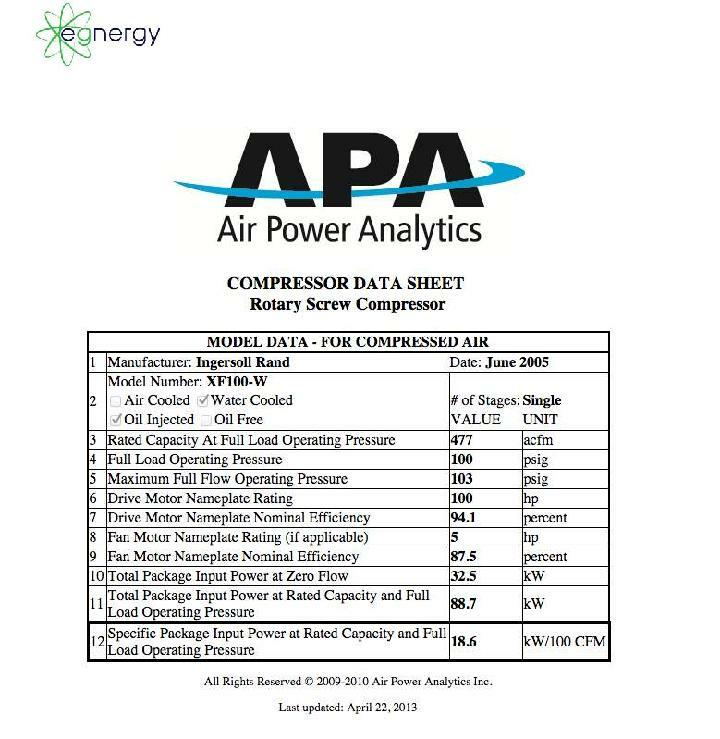 The compressed air system efficiency was calculated by comparing the rated CFM/HP ratio of the operating compressor to the actual CFM/HP ratio of the compressed air system. 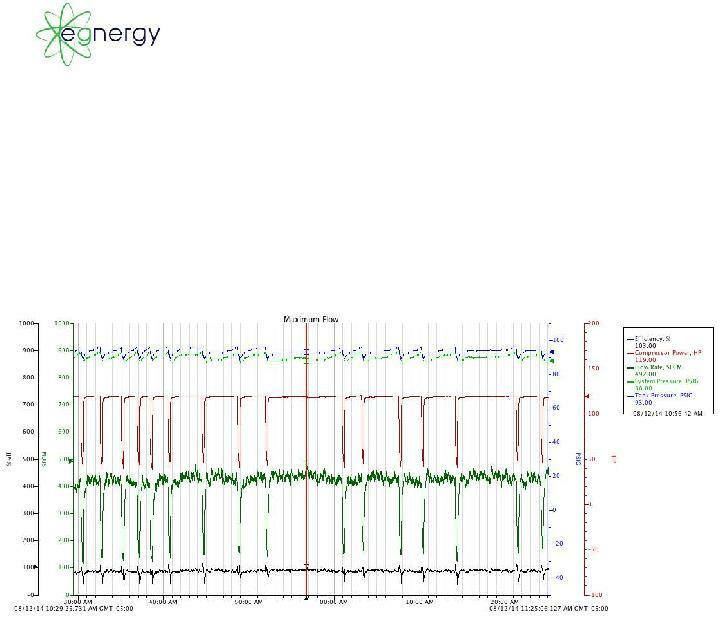 The nameplate flow rating for this compressor is 495 CFM with a power rating of 122 HP (see CAGI compressor rating in Figure 4). The data collected shows an average flow rating of 336 CFM with an average power of 106 HP. This gives us an ideal ratio of 4.1 CFM/HP and an actual ratio of 3.2 CFM/HP. The ratio of actual to ideal gives system efficiency, which is 78%. Lower plant pressure: One opportunity for savings for Kohler Reynosa is to reduce the pressure in the distribution system to the minimum possible without affecting production. The minimum plant pressure during the study was found to be 81 PSI at the Channel Welder and 80 PSI at the Cut To Length section of the plant. It is reasonable to assume that 80 PSI is a good starting point for plant pressure, but it may be able to be lowered beyond that. This will reduce the compressed air flow of the plant by around 5% because there will be less force to push the air through the leaks. The curve above is a representation of variable speed drive and online/offline controlled compressor efficiency. The curve is used by first calculating the ratio of compressed air storage to maximum compressed air flow. This ratio is used to determine which line the system efficiency falls on. The capacity of compressed air storage for Kohler is 1060 gallons while the compressor capacity is 495 CFM. This gives a gal/CFM ratio of approximately two. It is fairly obvious from the graph above that a ratio for gal/CFM of two is less than desirable. 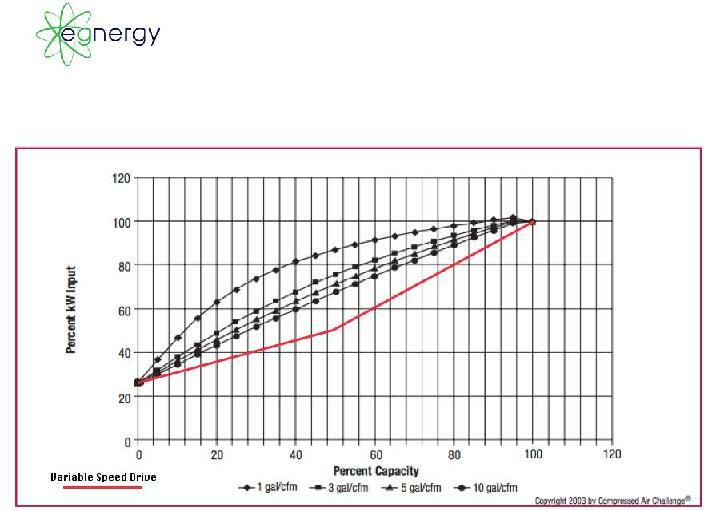 The red line on the graph represents the ratio of flow to capacity with a variable speed drive. The ratio is 1:1 from 50% capacity to 100% capacity and is the most efficient way to operate an air compressor. Pressure differential: Another parameter that was examined was the differential in pressure between the compressor room and the facility. This differential pressure is important because if it is large it can cause an inflated pressure at the compressor room to compensate for the pressure drop in the distribution system. The pressure differential at the Kohler Reynosa facility is around 9 PSID from the tank to the Cut To Length section of the plant. 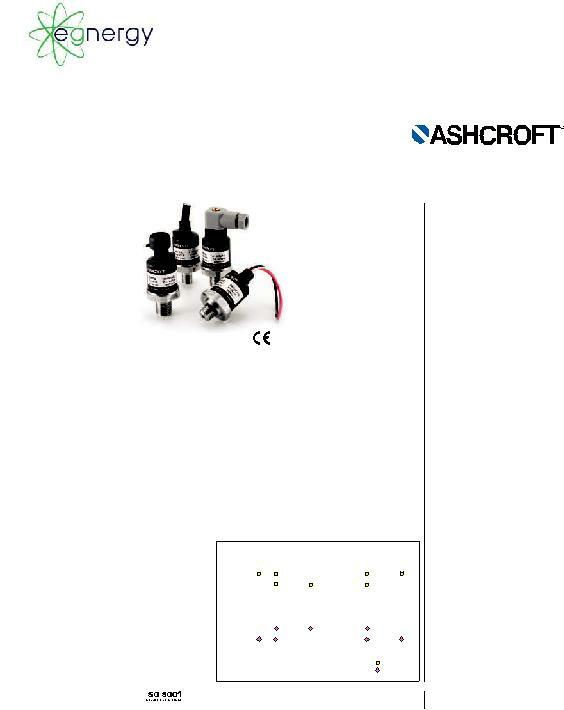 The addition of a flow control valve to separate supply from demand in the system and high efficiency low pressure drop filter will help to minimize this pressure drop. The Channel Welder has too many filters and regulators in the piping prior to entering the machine. All filters but one should be removed to reduce pressure drop during machine operation. The compressed air system has four electrically operated drain valves. Each of these drain valves represents a great opportunity for savings. The list below details the drain valves and how long each is open. air system is operating at 3.2 CFM/HP it is like a 27 HP compressor operating for 458 hours of the year. Replacing these drain valves with no loss drain valves will save Kohler around $1000 pear year. 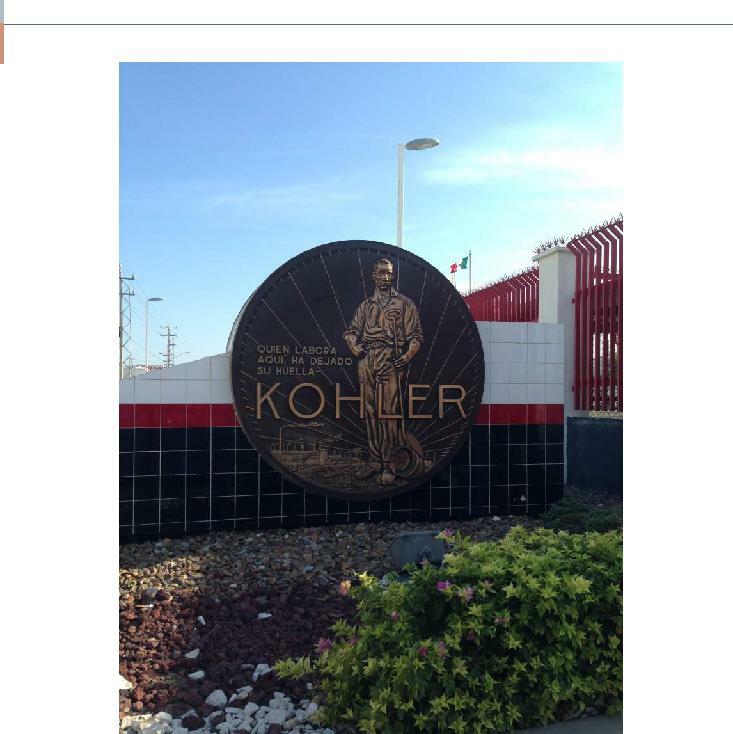 The compressed air system in the Kohler Reynosa facility is operating at a moderate efficiency level. There is a potential for an increase in efficiency of 22% for a total annual savings of around $33,000. 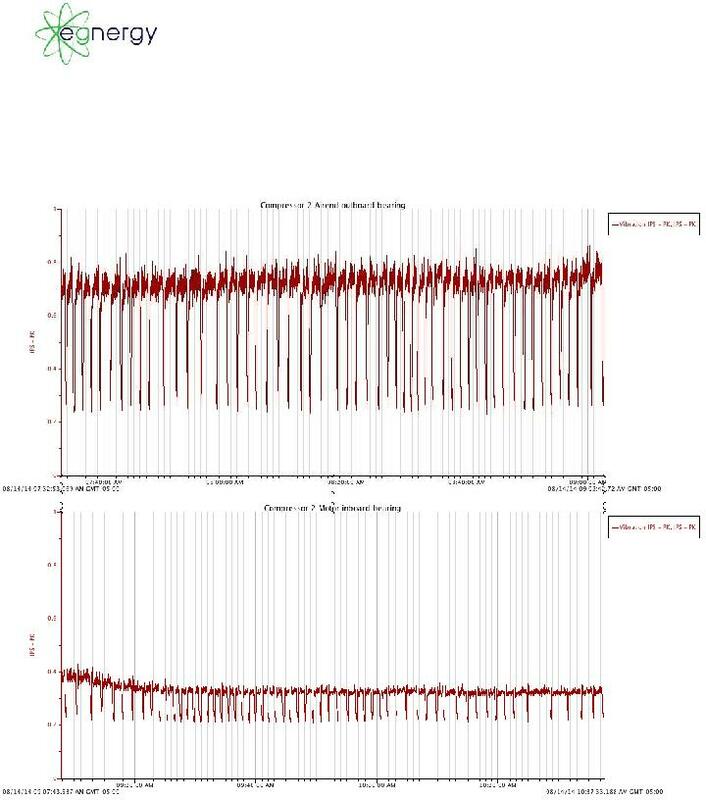 The graphs below represent the vibration on the air end and motor bearings in units of in/sec-PK. This measurement was taken as an extra for the report. Vibration in the air end and motor of both compressors reduces when the compressor is unloaded. The vibration of compressor number one is around 20% higher than the vibration in compressor number two. These numbers are interesting, but not very useful. The vibration of the bearings would need to be trended over time to see how the bearings are wearing in the machine.